Amelia Earhart once said, “Adventure is worthwhile in its self.” This belief, along with our shared attitudes about altitude, encouraged me to try the engine-free flight options in southern California. The entire southern coast offers numerous ways to fly into the wind. 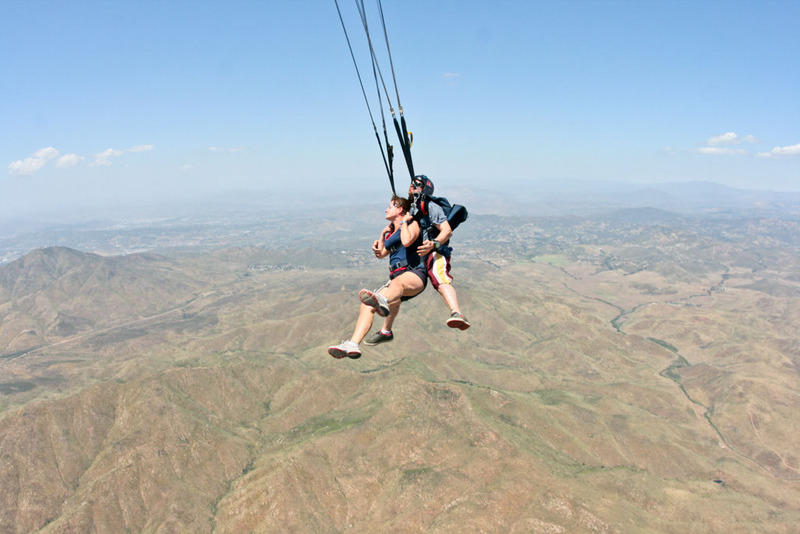 Whether you crave the thrill of bungee jumping, prefer the extreme, heart-racing pleasure of sky-diving or a serene paragliding flight, southern California is home to a variety of air sports set above the state’s beautiful, yet rugged terrain. Come along with me on my engine-free journey and see which activity brings you to new heights. See you in the skies. 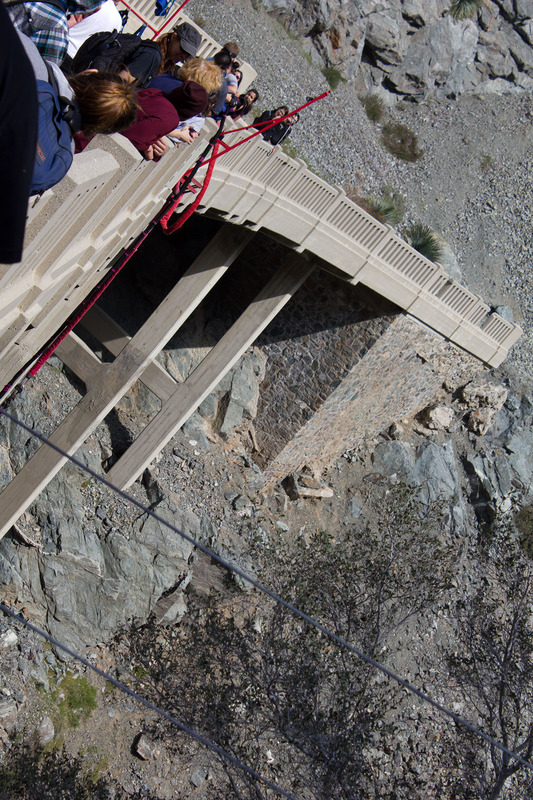 The Bridge to Nowhere, in Angeles National Forest provided a 120-foot platform, or what appears to be a toothpick as I stepped over the ledge to what could possibly be my final moments, for an unforgettable bungee jumping experience. Set deep in the San Gabriel Canyon, all guests meet at 7:30 am for a 5 mile hike over a rocky, rough trail that leads to the bridge. The trail crosses a creek 6 times in up to three feet of water. This part of the journey alone is not for the faint at heart. By the time I reached the bridge, I was tired and wet but my adrenaline kicked things up a notch; I was keenly aware of the Goliath stone bridge that rose up from the jagged rocks and rushing water below. I let go of the rail and star-fish leapt off of the tiny platform to a free fall. I found myself plummeting through the wind; the water and rocks below were getting closer and closer. Just when I thought I was getting too close to my impending doom, I felt the bungee cord begin to slow me down, but the journey was not quite over yet; A few feet shy of the water, I found myself being flung straight up toward the bridge and plummeting again and again and again with a series of bounces. With each bounce, a scream of excitement escaped my throat. Once I finished bouncing, I was elated with happiness and adrenaline. Overcoming the initial, internal fear that numbs your body makes you feel like you can do anything. The sense of accomplishment is overwhelming. I wanted that indescribable, free-falling feeling to last forever! If river crossing, rugged terrain and bungee cords are not your thing, my next journey may be your “flight of fancy”. 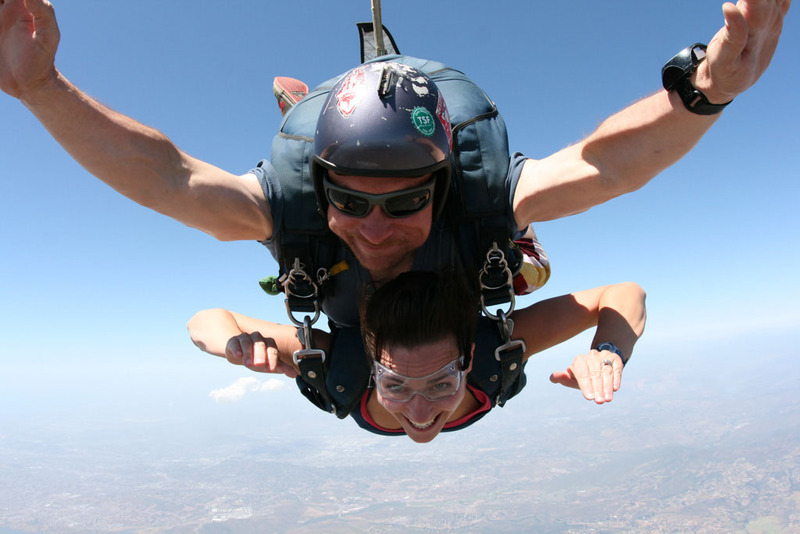 My incurable thirst for adrenaline and flight was feed by a 13,000 foot skydiving adventure with Skydive San Diego. Over 2 miles above southern California, you have a visual vantage point that few people ever experience so clearly. With nothing obstructing your view, the wind rushing in your face and free falling through the air at 120 mph, your senses are heighted to a level of euphoria. 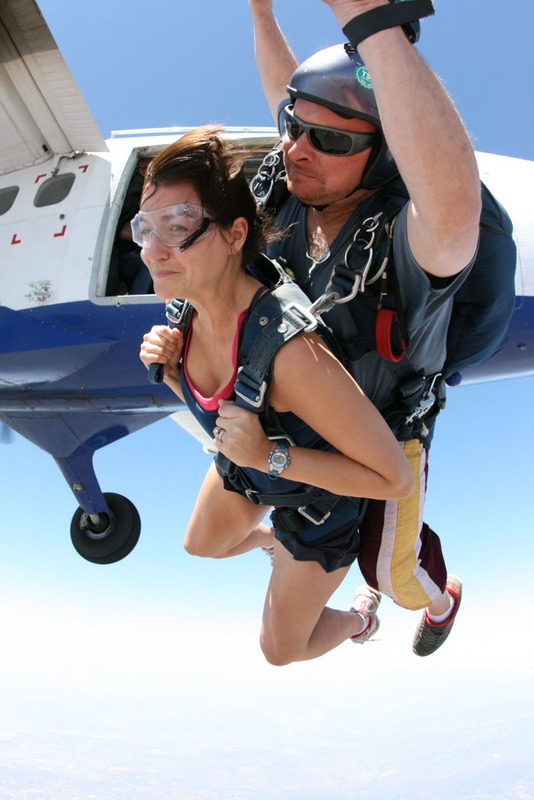 For me skydiving with Skydive San Diego had two major advantages over bungee jumping with Bungee America. First, I didn’t need to hike 5 miles before getting to the real experience- the airplane and the instructor did the job for me and I could concentrate entirely on the activity I wanted to do in first place. Second, in skydiving I could reach higher altitudes and enjoy the euphoric state of free falling for extended periods of time (I was in free fall for over 60 seconds). The feeling of the free fall before the parachute is opened is something that can’t be compared to anything. While looking out the window during the plane ride, it becomes blatantly obvious that you are about to partake in something completely unnatural. My stomach was rolling like I was on a fighter jet and my thoughts must have been written in my face. My instructor initiated the usual chit-chat but it all sounded like a Peanuts character talking to me; I nodded my head in understanding but I heard nothing. Finally, we were at 13,000 feet and I left my body. Like a robot, I had no control. I did what my instructor and the photographer told me to do without thinking. Before I processed what was actually happening, I was out of the plane and in the air. I was too busy smiling and breathing and keeping my eyes wide open to really realize I was falling, but I was. I was falling at 120 mph and it was like a dream. But not like the scary dreams where you’re falling and you think you’re going to crash. It was more like a peaceful falling and with my instructor strapped to my back; I felt a false sense of safety. I saw water and mountains for miles and I was laughing internally. The outer-body experience while free-falling seemed to last a lifetime. It was beautiful. I was beautiful. I could conquer the world. The 7 minute journey back to the ground was surreal and I breathed a breath that was fresh and new. I was hooked. As we soared to the ground with a large red and white wing above our heads, I took in the stunning scenery that is southern California. A joy that I didn’t know existed took place as we turned and glided through the sky with the parachute open. Free falling was only part of the journey. I wasn’t ready for a solo skydiving experience, but I wanted the power of controlling the parachute and it was then that I decided to try paragliding. Eagle Paragliding is known as the best choice for all levels of paragliding training in the United States so I was off to Santa Barbara to pilot my own glider. The sense of accomplishment I gained by controlling my own flight increased my confidence and had a positive influence on my professional and personal life. It was only during paragliding that I finally felt complete accomplishment, control and freedom. 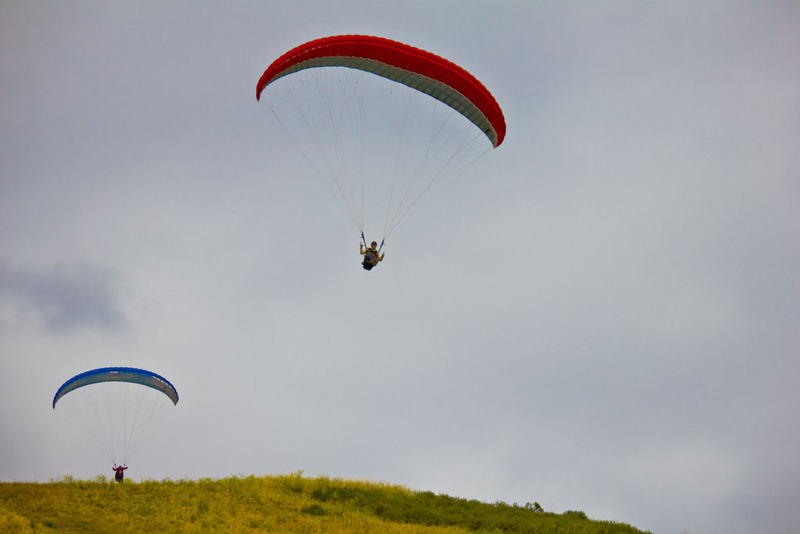 The advantages of solo paragliding over tandem skydiving are mostly two: in paragliding you have more control. You make the turns and control your landing. The second major advantage of paragliding is that you don’t need an airplane to lift you – just find a hill, run and start flying. After a brief, but thorough, training session, it was time to leave the safety of the ground behind and head into the skies. The owner and trainer, Robb, along with his entire staff, has a dedication and passion for teaching that surpassed all of my expectations. Although I was nervous for my first flight, I felt confident and in control. The two-way-radio was my security blanket as I prepared for flight. I was weak in the knees and my adrenaline was pumping as I spread my wings and ran along the training hill for take-off. I left my comfort zone behind and launched away from the site. It was a breath of fresh air, literally. I was soaring like a bird with elegance and grace. That initial flight was one of the most shamelessly joyous moments in my life. 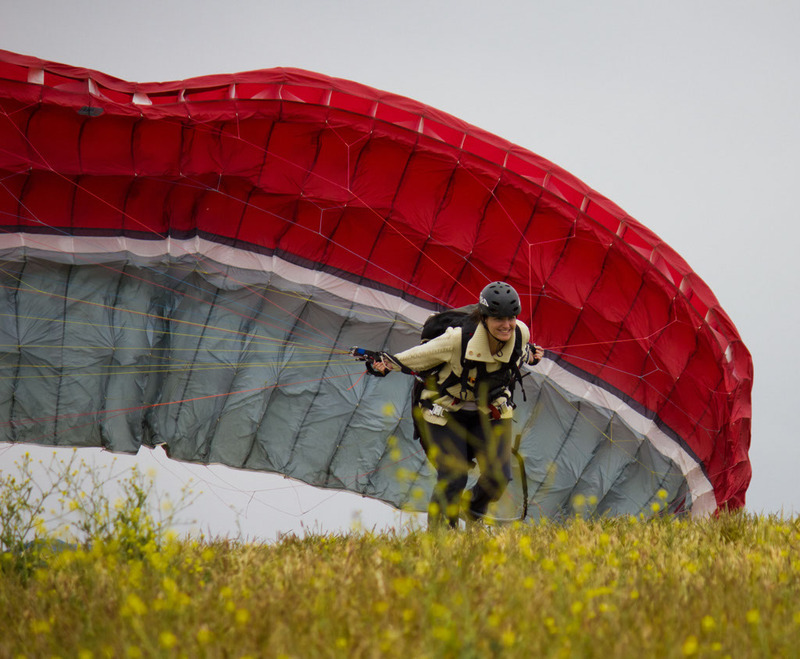 The feelings of paragliding and skydiving are often compared, but it is a misconception. While paragliding, I felt a kind of steady clarity rather than the wild, sharp adrenaline rush while skydiving. Soaring in almost total silence with nothing obstructing your view is so peaceful and serene that I felt as if something changed inside of me. Over the course of the 8 hour day, I become more confident in my flights. The effortlessness of movement once airborne gives you enthusiasm that you could have been a bird in a previous life. It was this experience, more than all the others that truly made me feel like I was flying. My engine-free journey changed the way I view flight, adventure, and life. The initial surge of adrenaline while bungee jumping, the heart-racing, full minute of uncontrolled free-falling while skydiving and the freedom of soaring while paragliding will stay with me for the rest of my life, but I have not conquered the skies; I’m just beginning, and southern California will allow me to do just that. You can win your own skydiving experience at Bucket List Publications. Check it out before March 12th, 2012 and don’t miss the chance to make your bucket list dreams a reality. This entry was posted in Adventure, Bucket List, Bucket List Publications, California, Flight, landscape, life, Photography, Travel, Uncategorized, USA, vacation and tagged adventure, bucket list, Bucket List Publications, Bungee Jumping, California, extreme, life, Paragliding, photo, photography, skydiving, travel, USA, vacation by lesleycarter. Bookmark the permalink. I could never bungee-jump, but paragliding seems strangely attractive… don’t think they have any around here, more’s the pity. Bungee-jumping was harder than tandem sky-diving because you have to actually let go yourself; I did love it though. The adrenaline rush that I felt was unmatched by most extreme experiences. Paragliding is peaceful. The serenity you feel while gliding over the land is uplifting. Although the first “flight” is a little nerve racking, what follows is a beautiful, surreal experience. There is technique involved so it’s important to pay attention during training but most people feel like buying a kite before the day is over. Where are you from? I would have guessed that paragliding was in most locations. The photos are fantastic! I think I’ll pass on the bungee-jumping, however. Also, I enjoyed Needle in a Haystack. My “baby” turns 15 later this month. Thanks for your kind words on “A Flotilla of Friends.” How did you find it? Thanks for the kind words. Do you have a boy or a girl? I’m ill-experienced, but I love sailing. I think I saw the picture for A Flotilla of Friends in the travel section tags so I gave it a read. Same, somehow I would jump 10,000 feet from a plane or paraglide but not do bungee-jumping. Adrenaline and Adventure is need for us to live! The bungee jumping is the hardest. You are completely responsible for your own fate. But when you can do that, you can do anything! Thanks for your comments; they are appreciated. Thanks again for stopping by to read my blog. I admire your true spirited love for nature and it is quite interesting. Keep been bold and enjoy every minute of it! All of this just seems like a ton of fun. Life changing fun, even. Kind of makes everything else seem…much less important. This is definitely something I’ll have to try! “Terror” is the word that comes to mind. Great Pics, Lesley! Please keep the comments coming; they are appreciated. I will expect to see a new post shortly after your big day. Best wishes! Children are the greatest adventure in life; I can’t wait to have new experiences with them. Please keep reading and keep commenting; it is appreciated. Yeah. I’m TOTALLY panicking just looking at these pix! Congrats to you — looks like quite an experience. Each adventure offered something drastic and life-changing. I think I must have been a bird in another life because I would live in the skies if I could. Have you ever been sky-diving, bungee jumping, or paragliding? Terrific article. I think you just convinced me to go bungee jumping, even if it is a bit of a hassle. I went skydiving in Santa Barbara, CA and it was one of best experiences of my life. We went 13,000 feet and I can’t wait to do it again. There is that feeling when you’re going up in the place like “I’m about to jump out of this perfectly good plane, I am not landing with it…” But it’s totally worth it. Sky-diving is something that when you do it once, you want to have that feeling for the rest of your life. It’s like a drug, and I, too, am addicted. 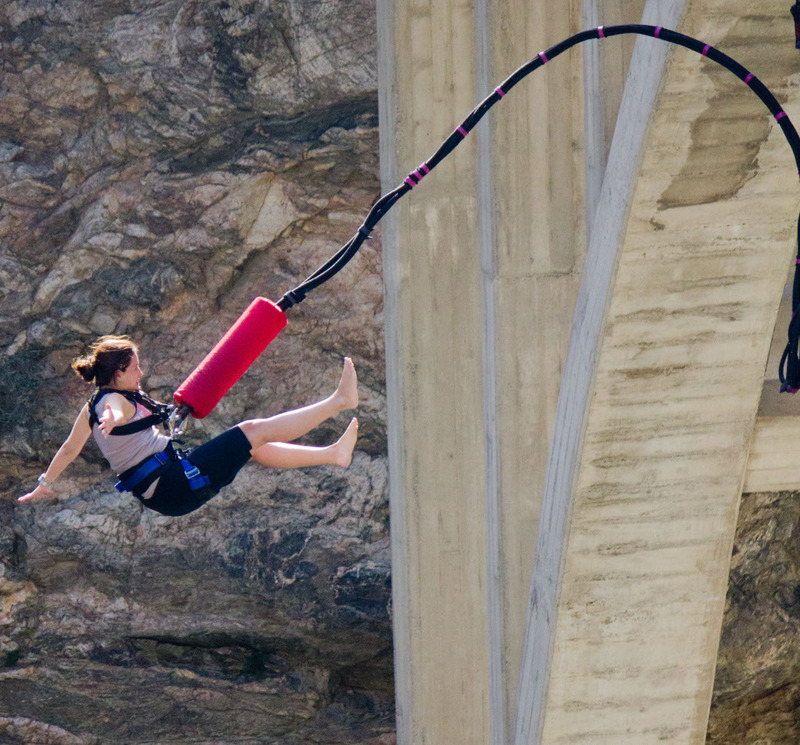 Bungee jumping is a different, but equally exhilarating, experience. Did you sky-dive tandem? When you are standing on a bridge or platform and you need to let go or jump yourself, it creates a totally different feeling in your stomach. You become solely responsible for your own life. When it is over, you feel like you’ve accomplished something spectacular. I hope you give it a try. Watch for a free skydiving opportunity on my new online magazine, Bucket List Publications – http://www.bucketlistpublications.com/. It will be featured within the next two weeks! Would love to post another of your wonderful photos at toemail, if you do not mind? … 3rd photo down. Sure thing; please just link it to my blog or even my Facebook site. My mother wanted to go for her 50th birthday and although we didn’t make it out that day, I’m certain we will make that jump together someday soon. my palms are sweating looking at those pics. That’s what I like to hear! Have you ever been sky-diving, bungee jumping, or paragliding? Each experience has its own heart-racing perspective. I love adventure! It was an amazing experience to be in the sky! Wow, yes, seconded! I love the pics of you sailing around in the sky, it must have felt amazing. That looks amazing; I wish I had the guts to do things like that! You just have to do it. If I thought about jumping out of a plane or off of a bridge for too long, I would find a 1000 reasons not to do it, but the freedom of falling through the sky is untouchable and well worth the journey. Well, believe me, as a pregnant woman, I, too, am jealous of your blog and your posts! I’m also hungry! Sheesh – you did it all! Thanks! As a former English teacher, I love that your blog is mostly about books. If I’m not blogging, I’m reading. I read that you took some time off to travel. Have you been seeing many new places? So, I like to think of myself as adventurous, but I still don’t think I could bring myself to go skydiving or bungee jumping. Huge kudos! Sky-diving is about getting yourself into the plane; the rest is up to the instructor strapped to your back 😉 Bungee jumping is a little more personal. BUT I would strongly recommend both. I’ve never heard someone say they didn’t enjoy it afterwords. I love your picture of New York. Is that where you’re from? Originally, I’m from eastern Canada and I’ve traveled to New York repeatedly. Have you ever been to California? Hey there! I love Canada and it’s people. I have a ton of close friends from BC for some reason. I’m originally from New Mexico, I moved to New York to study classical voice- opera performance and am now pursuing anything creative! I have been to California only twice, as my family who live there always visits everyone else for some reason. We MAY bombard them with Thanksgiving at their place this year! Canada certainly is unique for its people and culture. Although I miss my family and friends dearly, I’m proud to now call California my home. Are you enjoying New York? It has a lot to offer that’s for sure. I’ve only really experienced the touristy stuff, but I’d love to spend some more time there. The problem is… if I fly across the country, I can’t justify going to New York to my family. They would assume I’d be back in Nova Scotia. Paragliding was the most peaceful, beautiful experience. It is a great way to start your flying journey. I was just checking out your blog and I’d have to agree with the “lot in common”. Great shots of Rome! You are so amazing Lesley! While I hold little interest in bungee – I am hoping to get the chance to do a tandem out of a plane! 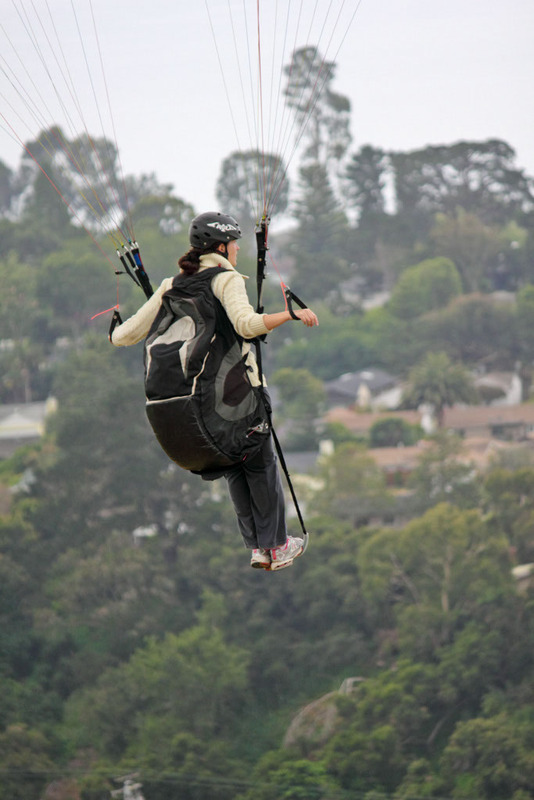 You are even more awesome to have paraglided. I don’t know if I would have made that leap – but you make it sound doable! The closest I have come is parasailing. That was a hoot – wanted to stay up there forever! Great photos too! Looks like some great adventures! Will have to try the skydiving – will see about the paragliding! I truly enjoy your blog and think that you are amazing as well. Travel has always been part of who I am and I hope that continues throughout my life. Out of the three “flight” experiences, sky-diving was my favorite. I felt like I’d accomplished something beyond the realm of capability. Paragliding is not as extreme as you would think and I took great pleasure out of controlling my own flight, which was only achievable through paragliding. Give them both a try and I know you will find yourself in the skies again and again. Thank you Connie. I always try to live life to the fullest and enjoy every day. You, my dear, are braver than I. The brave part of sky-diving is walking to the plane; the rest is up to the instructor. I had a look at your blog since I loved the pictures. Do you live in California as well? You are welcome, yes we are based in gorgeous Cali. So glad you like our blog! Thank you for your comment! I loved each experience and took something away from all three of them. I hope you get to enjoy the feeling of controlling your fears and the skies very soon. The weather is always perfect in California; that’s a major part of why I moved here from eastern Canada. I know when you rationalize sky-diving, it seems completely ridiculous. But the feeling you get when you first leave the plane, it beyond anything I ever thought imaginable. I wish I could do it daily! I’ve always wanted to go to Bali. What is daily life like there? Have you always lived there? Do you travel? Seriously though, people like you are my best friends and enemies at the same time! Have you done any extreme adventures yourself? It can be addictive. Wow, thats amazing, I think I would be clinging on for dear life if I did that. The closest I have come to that is para-sailing. Those are awesome pics. The main goal is to not freak yourself out. If I thought about what I was doing too much before hand, I probably wouldn’t do it. Thanks for the great comment on the photos. I’m not much of a photographer, but I’ve had amazing opportunities to make up for it. I love the picture of your para-sailing, by the way. Great angle! Reading your blog, it felt like I was with you … all the way (remember how it feels like reading a very exciting book in its climax? That feeling!). How I wish I have your courage and your adventurous spirit. I am not sure if I will ever have the chance to do these amazing things you have done in my lifetime, so thank you for sharing your experience and your wonderful pictures. Best of luck in your other adventures! Thank you greatly for your kind words. There are always opportunities to try new, adventurous things; I hope you experience them all. sky diving looks so cool. I love it! It looks so excruciatingly exciting! This is actually on my bucket list. I hope that you accomplish everything on your bucket list and kudos to you for having one. You are my perfect definition of the word, DAREDEVIL. I taking my hat off to you on that. Do you like extreme adventures? Hell, yeah .. although the only extreme adventure I had so far are wakeboarding and climbing some of the most dangerous mountains in my country. I mean, I am taking my hat off to you on that … Tsk tsk tsk! So exciting activities that I never do. If I thought about jumping out of a plane or off of a bridge for too long, I would find a 1000 reasons not to do it, but the freedom of falling through the sky is untouchable and well worth the journey. On my blog I speak of the road less traveled! This is what I was talking about; you guys are awesome! Hi Lesley, Great pictures and narration. I am wondering if you talk a bit more about the impact this has had in your personal/professional development?.. You say it increased your “confidence and had a positive influence”. When I talk about the confidence it gave me it is similar to what you just said, “Hey, if I can jump out of plane from 10, 000 feet, I can do anything!” Even during the fall, I just felt like I was completely and utterly free. I had no restricts and I’ve been trying to live my life like that. Sometimes my family think that I’m completely insane, like driving to Mexico two weeks ago and crossing the border, but I just don’t ever want to wake up and say, “I wish I had of…”. There are so many amazing opportunities in the world and I’d like to try them all. As a teacher, I try to instill that same sense of freedom and confidence in taking changes, even if it is just with their school work or a school sport. Sometimes when we do things that are completely outside the realm of our capabilities, it is then that we truly learn who we are. Thank you for your comment; please keep them coming. I enjoyed reading this, even though the palms of my hands are now damp and aching. My own ‘bucket list’ is going to contain things which keep my feet on terra firma. Extreme adventures are like drugs; once you try it, it’s hard to stop. Do you have a bucket list? I’ve always had this unwritten goal of seeing 30 countries by the time I was 30 years old. Then, when I accomplished that, I wanted to have a family. Now, I’m just waiting for the biggest adventure of my life – child birth. I hope that the adrenaline kicks in and the pain becomes a distant memory. Thanks for your comment; keep ’em coming. To be honest with you, I just came here to post some backlinks.. but as a californian living in socal, I didnt even know this existed… I just checked out skydive san diego and I might go ahead and do this since I live in LA. Thanks for the great info! Nice blog! And– skydiving– something on my own list of “things to do”! I love when others have a bucket list as well. I find it gives me something to strive toward. Keep the comments coming; they are appreciated. Thanks; with such an amazing experience, the post almost wrote itself. This has made me ridiculously excited (if a little terrified) for the sky dive I’m planning to do when I travel Australia next January. Well done you for being such a dare devil! Don’t change your mind about the sky-diving; it will change your life in a beautiful way. It can be very addictive. Good luck in Australia. I’ve yet to go there but I’m hoping within the next couple of years. Thanks! I loved every minute of it. Wow, AMAZING post and photos! You are a brave, brave soul! . . . Felt like I was soaring through the air with you on your various adventures! Something so dramatic as sky-diving. bungee jumping, or paragliding leaves a lasting impression on your emotions and your life. It makes for a post that writes itself. I feel terribly rude asking you this, what do you do for a living? Or is adventure your living? No pressure to answer though! It is kind of personal. The career question is something that I always want to ask people when they travel regularly or do extreme adventures so don’t worry about asking. I was a teacher for 8 years and I wrote for a few different travel magazines on the side (mostly freelance stuff). A lot of my travel and adventures were part of an article or writing assignment. I also taught summer camps in different countries. It was never enough money to put some away or save, but it was enough extra to see somewhere new and try the local adventures. Although I always had a permanent teaching position with a fair salary, I lived modestly and saved money for what was most important in my life – travel and adventure. Now, I’m living in California and almost 4 months pregnant so yet another new life and adventure has begun. Great post, Lesley. You’ve really described the adrenalin rush perfectly. Congrats of the well-deserved FP. I did nine static line parachute jumps many years ago (last one in ’84) and to this day I remember each and every one of them! Still want to try bungee jumping, paragliding and tandem skydive, or perhaps accelerated free fall. When you take part in something so outside of your comfort level, it stays with you for the rest of your life. Try bungee jumping, paragliding, skydiving, and everything else that you can! It’s a life changing experience. Thanks for your encouraging words; please keep the comments coming. I can’t wait to write about my next adventure. It was a pleasure to write and even more a pleasure to experience. I LOVE this post!! The way you describe each of your experiences and the gorgeous photos that you have to back them up is just incredible! Seriously, I want to come hang out with you for a while…none of my friends want to do these things with me. Haha! Where do you live? My new adventure is just around the corner, I’m sure. This post is cool! Paragliding looks to be the way forward. Paragliding was definitively the most peaceful, in control experience of the three. Thanks for the comment; keep ’em coming. I never want that drive for adventure, thrill, and adrenaline to end. That initial feeling of leaving the ground is the hardest part. There is something extremely surreal about controlling your own flight though. Paragliding was definitively the most peaceful experience of the three. You should give it a try again because once you’ve experienced it, you long to do it again. The events leading up to the jump can be extremely overwhelming and it is easy to psych yourself out, but if you try to enjoy the beauty around you and leave your brain turned off to fear, it can be the most beautiful experience of your life. I long to be in the skies! The air up there is bracing. I live each day waiting to fall again to the earth, seems to keep me in the now when I have my feet on the ground. I stumbled upon your blog and look forward to more of your adventures…. Thanks for reading and commenting Bryan. I think that most extreme adventures are addictive. I long to be in the sky or on the water and I can only hope that when my child is born, he or she will love adventure just as much.